Lethbridge student Dominique Pietras, 18, has been peer teaching the ACT High School CPR program ever since she learned it in Grade 10. 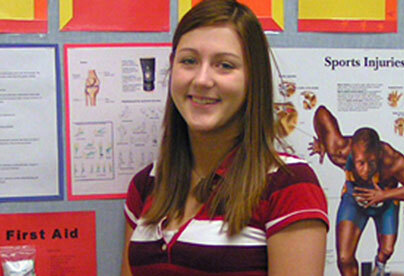 After dedicating much of her high school life to first aid training, she graduated from Catholic Central High School with plans to become a paramedic. Dominique’s school is special in that it allows for a specialization in sports medicine. “I put passion in to what I do, and I take pride in my basic and athletic first aid skills,” said Dominique. After taking the program in combination with her school’s other first aid courses, Dominique was able to put her skills to use several times throughout her high school career. She has taped ankles on sports fields, checked pulses of people who were having trouble breathing, and once at the community pool where she works she assisted someone who was choking on a small candy. But Dominique didn’t stop at her own training – she then went on to assist her teachers in delivering the lifesaving program to her peers. In her graduating year, the ACT Foundation, in partnership with the STARS Foundation, honoured Dominique with a Student Leadership Award for work. “I peer teach CPR in the sports medicine classes, and I show the students the proper technique,” explained Dominique, who also trains other students in athletic first aid, such as learning emergency signals on the field and how to tape ankles and wrists. “STARS congratulates Dominique on her achievement, her community leadership and her involvement in making a difference,” said Dr. Greg Powell, President and CEO of the STARS Foundation. Dominique is humble when asked about both her peer teaching and the emergency assistance she has been able to provide for others. The ACT High School CPR Program was made possible in Catholic Central High School, thanks to the generous support of ACT’s Alberta partners: the STARS Foundation, a founding partner for the program, and Alberta Education. ACT’s lead community partner in Lethbridge is the Kiwanis Club of Green Acres. Mannequins and curriculum resources were donated to the school and teachers are trained as CPR instructors for their students.